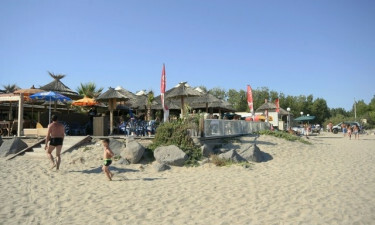 The warm Mediterranean sun beckons you to Les Sables d’Or camping in the south of France. We keep the kids enthralled with the surprise-filled water park while you sit back and bask in the sun. 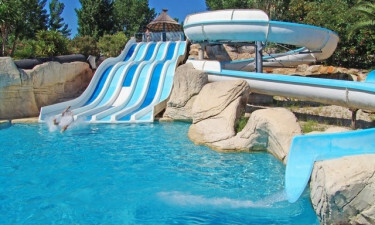 Children especially enjoy the endless fun activities in this luxury camping site. Single travelers, couples, and parents can take advantage of the numerous onsite sporting and spa facilities. Les Sables d’Or is all about luxury camping and a LuxCamp mobile home gives you the base from which to launch each day. Whether you want to simply work on your tan or tone your muscles at a water aerobics class, there’s something for everyone at all fitness levels. Qualified staff will make sure the kids have a safe and memorable camping holiday by providing a variety of organized daytime activities. Why choose Les Sables d’Or? 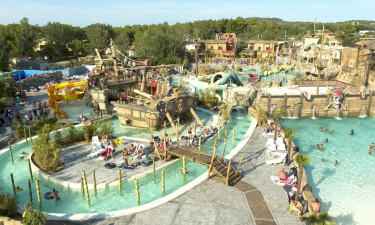 Les Sable d’Or’s extensive aquatic park is a pirate-themed tropical paradise with palm trees and a labyrinth of paddling pools, swimming pools, water slides, slides, simulated wave pools, and White Water River. Ahoy matey — your little sailors will be delighted with the surprises aboard the gigantic pirate ship. Mythical sea creatures abound in the waters around the ship. The smaller ones will love the mushroom sprinklers and mini slides.